Police watch as demonstrators protest the killing of teenager Michael Brown on August 19, 2014 in Ferguson, Missouri. Police watch as demonstrators protest the killing of teenager Michael Brown on Aug. 19, 2014, in Ferguson, Missouri. By midnight on Wednesday, this call-and-response, and others like it — “Hands up, don’t shoot,” “What’s his name? Mike Brown,” and the old standby, “No justice, no peace!” — had been going on for hours. An early-evening thunderstorm and the calm but firm interventions of local clergy helped make this perhaps the most peaceful night since Ferguson police officer Darren Wilson shot and killed 18-year-old Michael Brown 11 days earlier. Still, there were several moments when it felt like a wrong move — a thrown bottle, a shove from one of the heavily armed officers guarding the street — could once again lead to violence. The protests, nearly everyone agrees, were about more than Brown, about more even than police violence. They were about Ferguson police being nearly three times more likely to stop black motorists, and nearly twice as likely to search them. They were about the unemployment rate for young African-Americans in St. Louis County being double that for young whites, and the poverty rate being more than three times higher.1 Just weeks before Brown’s death, workers demanding higher wages picketed in front of the same local McDonald’s that has since become a gathering point for protesters. The protests were also about more than Ferguson. 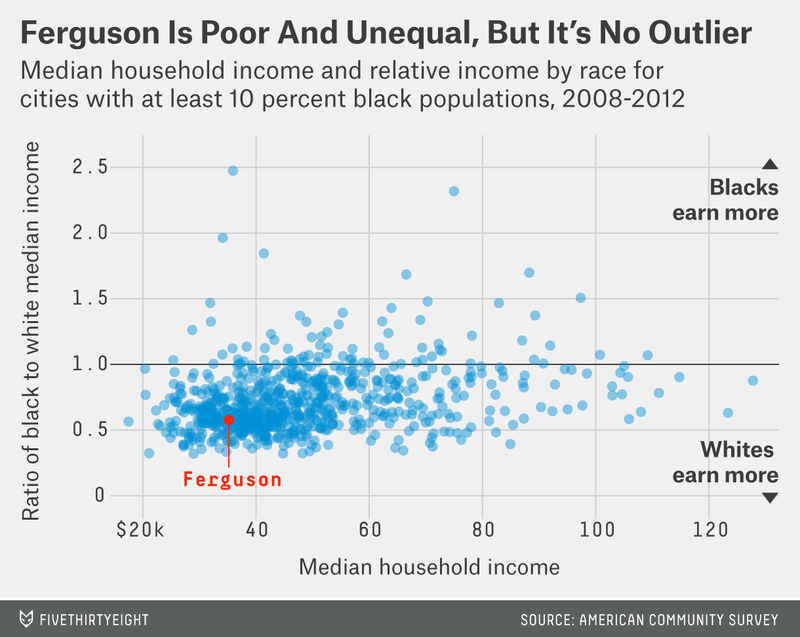 Because Ferguson isn’t an outlier; it is, at least for a large part of the country, the norm. The same fuel of poverty and disenfranchisement exists in similar communities from Los Angeles to New York. The spark just happened to come in Ferguson. Bishop Timothy Woods, one of the clergy members working to keep the peace, said the protests reflected a feeling of hopelessness among young people in low-income communities across the country. North County is the local term for the dozens of small cities — Ferguson, with its population of 21,000, is one of the larger ones — that make up the northern part of St. Louis County, which surrounds the politically independent city of St. Louis on three sides. (The fourth side is the Mississippi River, across which lies East St. Louis, Illinois.) 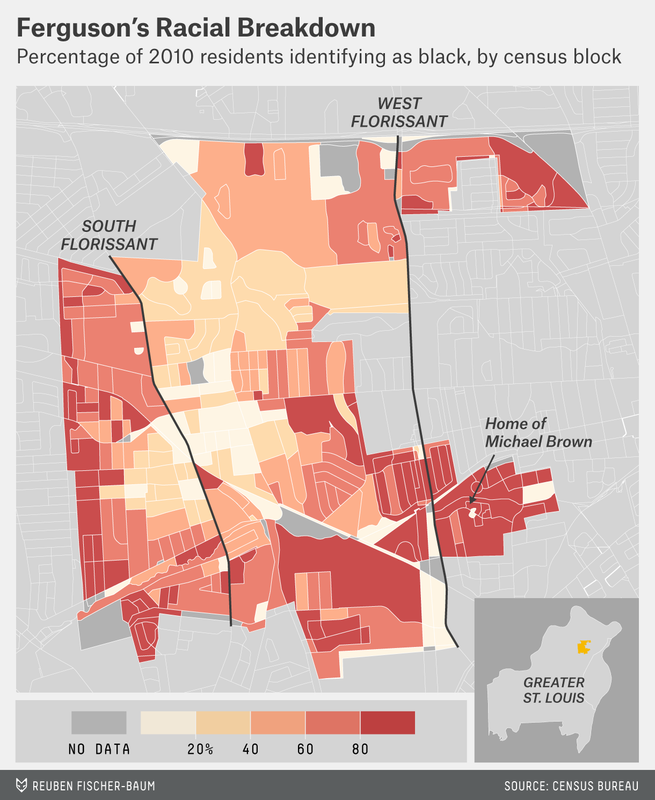 Once made up of predominantly white, middle-class suburbs, North County has over the past 25 years grown progressively poorer and blacker, as white residents have moved to the more affluent suburbs to the west and have been replaced by people escaping — or at least trying to escape — the poverty of inner-city St. Louis. The St. Louis metropolitan area ranks as one of the country’s most segregated, with the southern and western suburbs overwhelmingly white and the northern suburbs and the city itself heavily black. In some North County cities, African-Americans make up more than 80 percent of the population. Ferguson itself, however, is about two-thirds black and is largely integrated internally. It is not particularly poor. Its median household income is about $35,000, well below the national mark of about $50,000, but ahead of many neighboring communities. In the north end of the city, which features some large, handsome homes, household incomes are close to the national average. Nearly 60 percent of Ferguson residents own their own homes. Most of the city looks nothing like the tinderbox of poverty and segregation that Americans have come to know in the two weeks since Brown’s death. One of the most important businesses on West Florissant, the poorer business district, is a McDonald’s. It became a focal point of news coverage when two reporters, The Washington Post’s Wesley Lowery and The Huffington Post’s Ryan Reilly, were arrested there several days into the protests. Two of its windows were smashed a few days later — reports conflicted about who did the smashing — and protesters used milk from the store’s fridge to soothe their eyes after police deployed tear gas. Through it all, the McDonald’s remained both a community meeting spot and a de facto newsroom; Lowery and Reilly were still working there on Wednesday, and even endured a good-natured ribbing from the store manager as he was preparing to close up for the evening. Three months earlier, the same McDonald’s had been in another, albeit dimmer, spotlight as the site of a demonstration where employees demanded a $15-an-hour wage. Workers at the West Florissant restaurant have been among the most active participants in the Show Me $15 campaign, the Missouri chapter of a national, union-backed movement to organize fast food workers. It’s no coincidence that the same McDonald’s was at the center of both demonstrations: The same sense of powerlessness that has fueled the recent protests existed long before Brown was killed. In a neighborhood where less than a quarter of young people have more than a high school education,3 fast food jobs and similar low-paying work are often the only opportunities available. But the jobs can be a trap. Missouri’s minimum wage of $7.50 an hour amounts to $15,600 a year for a full-time worker — and few get to work full-time. That makes it even harder to afford college and the pathway out of poverty it can provide. Jeanina Jenkins, 20, has worked at the McDonald’s for two years and makes $7.97 an hour; she said she rarely gets to work more than 20 hours a week. Marching on West Florissant Wednesday night less than a block from the restaurant, she explained that she is studying to be a nurse at the University of Missouri-St. Louis, but has to take this semester off because she owes $1,000. Asked if she thought she would be able to come up with the money to return to school next year, her previously forceful voice grew quiet. “I’m working on it,” she said. Jenkins, like most workers at the McDonald’s, is black. She had been out on the picket line in May, and she saw the two battles as connected. If there were more good jobs available, perhaps fewer young people would be out on the streets. 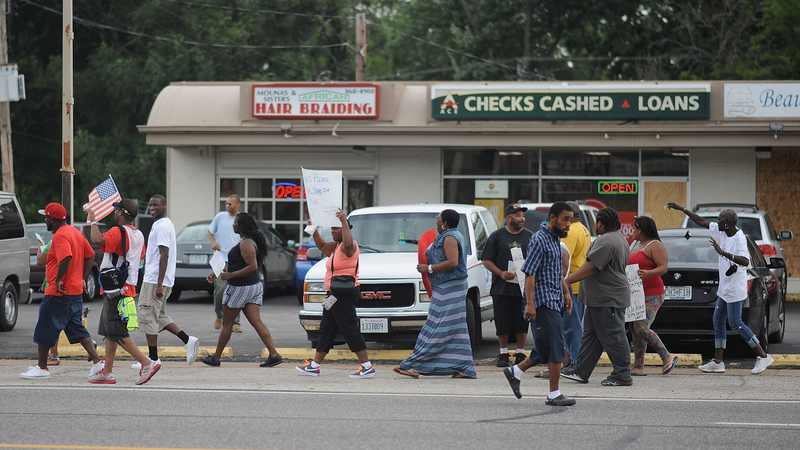 A protest on West Florissant Ave. in Ferguson, Missouri, on Aug. 19, 2014. Plenty of young people end up working little or not at all. Nationally, 36 percent of African-American adults under age 25 are employed, compared to 50 percent of young whites; even fewer are working full time. The combination of idleness and poverty often leads to a spiral of troubles that can be difficult to escape. Woods, the peacekeeping pastor, laid out a common scenario: A low-income worker fails to pay personal property tax on a car. Aggressive policing makes him more likely to get pulled over and ticketed for that offense. Poverty makes him less likely to pay the fine. Pretty quickly, a minor offense turns into a warrant, then jail time. A criminal record makes it harder to find a decent job, which leads to continued poverty. A recent report from Arch City Defenders, a local nonprofit that provides defense counsel to low-income defendants, shows how common the scenario described by Woods is. The report found that blacks are more likely than whites to be stopped in Ferguson — even after accounting for their large share of the population — and are more likely to be searched when they are stopped, even though they are less likely to be caught carrying contraband. In 2013, according to the report, the Ferguson municipal court issued three warrants for every Ferguson household.4 The figures were similar for several neighboring communities. “You talk to half the people out here, they’ve got warrants,” Woods said. For much of the past two weeks, national attention has focused on what it was about this little-known town that caused it to erupt. Among the specific factors: the fact that Brown’s body was left in the street for hours; the aggressive, militarized response by the police to the ensuing protests; and, beneath it all, the fraught racial politics of St. Louis and its suburbs. But ultimately, much of the situation in Ferguson is not unique. In its demographics, its economic challenges and its racial divisions, little distinguishes Ferguson from a hundred other communities. 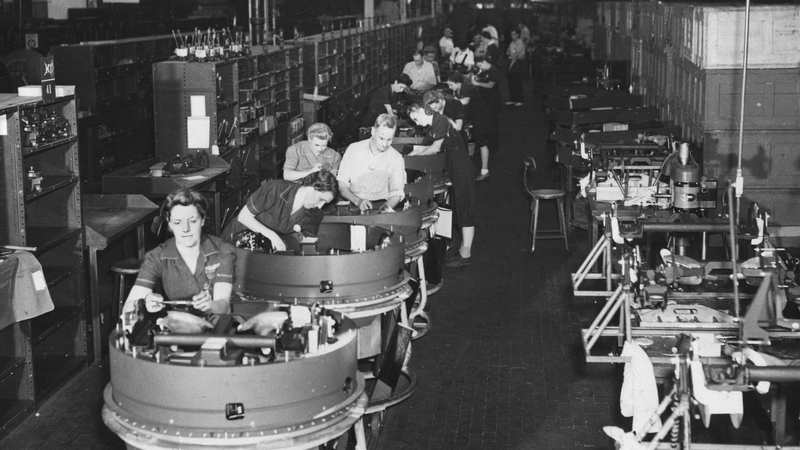 Workers at Emerson Electric Co. in Ferguson, Missouri, assemble turrets for B-24 Liberator bombers in August 1943. The recession added to the challenges. Parts of the city were hit hard by the foreclosure crisis; of the 10 Missouri zip codes with the most seriously delinquent mortgages, four are at least partly in Ferguson and three others are in other North County communities. That has turned formerly owner-occupied homes into rentals, often with absentee investors as landlords. The number of Ferguson residents living in poverty has doubled since 2000; its poverty rate, at 24 percent, is one and a half times the national mark. In all of that, Ferguson is typical of inner-ring suburbs around the country. It isn’t even a particularly extreme example. Ferguson’s schools are struggling, but unlike some surrounding districts, they retain their accreditation. Its foreclosure rate is high by Missouri standards, but is nowhere close to those in Florida, Nevada and Arizona, states that were at the center of the housing crisis. North County has lost much of its manufacturing base, but retains several large employers, including a multinational manufacturer, Emerson Electric Co., and a fast-growing prescription drug provider, Express Scripts. Ferguson’s experience with poverty is especially typical. St. Louis’s suburbs now have more people living in poverty than St. Louis itself, a pattern repeated across the country. Concentrated poverty of the kind found in southeastern Ferguson is also becoming more common in the suburbs. According to researchers at the Brookings Institution, the number of suburban neighborhoods with poverty rates above 20 percent has more than doubled since 2000. Merline Anderson, executive director of the Community Action Agency of St. Louis County, a local anti-poverty organization, said black families moved from the city to the suburbs in search of better housing, better schools and an escape from the inner city’s cycle of poverty. Some found it, as Ferguson’s black middle class can attest. But those who remained in poverty found that being poor in the suburbs is in some ways more difficult than being poor in the city. Public transit options are limited; Ferguson has a passable bus system for people trying to get into downtown St. Louis, but getting to the western suburbs where most major employers are based is much more difficult. Government services are often oriented toward urban areas, where poverty has been around longer and remains more concentrated. The same is true in the private sector: Many of the clergy members keeping the peace on West Florissant have their churches in the city, when they themselves live in the suburbs. And even when there are local services and organizations, poor residents are often short-term renters, with stronger ties to family and institutions in the inner city. The informal headquarters of Friends of the City of Ferguson is a side room at the Corner Coffee House on South Florissant, the wealthier Florissant. The coffee house, with its chalkboard menu and diverse clientele, looks very different from the Ferguson on display on the news over the past two weeks, which is exactly the point that Brian Fletcher, the city’s former mayor turned No. 1 defender, is trying to make. 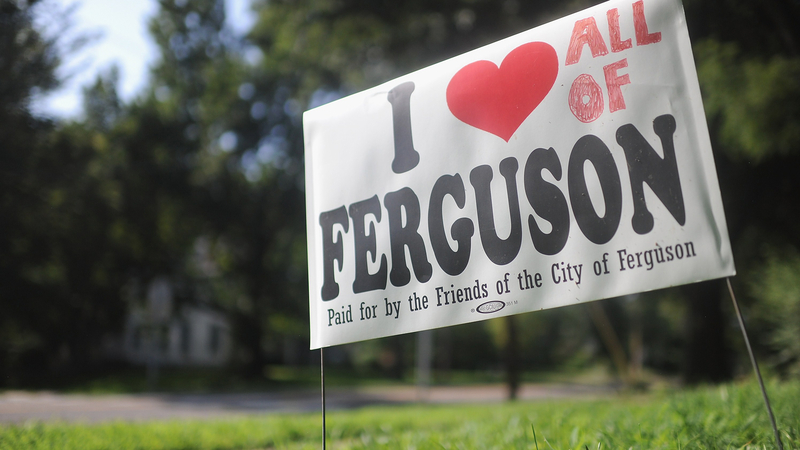 “We’re not what they’re saying we are,” Fletcher said, standing amid hundreds of “I Love Ferguson” lawn signs and T-shirts, which he had printed up on behalf of Friends of the City of Ferguson, a hastily formed organizing committee. Ferguson, as Fletcher tells it, has been unfairly painted as a community of poverty and strife. He says local nonprofits have been trying to promote diversity, community engagement and education, and he says he and other white community leaders have made efforts to get their black neighbors more involved — including, he notes, appointing an African-American to the City Council and asking him to run for re-election. “I would argue that we’re one of the most progressive cities in the United States,” Fletcher said. He is an unapologetic hometown booster, but he’s right that Ferguson’s story is more complicated than media reports might suggest. Unlike in much of North County, many white residents in Ferguson chose to stay when the city began to diversify in the 1980s and 1990s. Moreover, whites have moved to the area, said Shannon Howard, a local real estate agent. The tensions between the two Fergusons — the apartment complexes in the southeast and the middle-class suburbia in the north and west — are about class as well as race. In private, some black residents of middle-class Ferguson complain about Canfield Green and its neighbors in language that isn’t much different from that used by white residents. They talk about high crime rates and a transient population with little connection to the community. Race relations are complicated even on the middle-class side of town. Black residents I spoke to were unanimous in believing that the police department, which is overwhelmingly white, had a race problem; every one of them had a story of being pulled over for “driving while black,” and many African-American residents of other North County communities said they avoided driving through Ferguson for fear of being stopped unjustly. Within Ferguson, reactions to Brown’s shooting and to the protests that followed break along distinctly racial lines. Most black residents I spoke to wanted “justice for Mike Brown” and supported the goals of the protesters, even if they also worried about the impact of the negative attention on their property values. White residents tended to express sympathy for Brown’s family but believed protesters should let the legal process run its course. Atefa Young, a Ferguson homeowner for 30 years, was one of the black residents picking up a sign — she grabbed two, in fact, one for her neighbor. Talking about the city’s many civic groups and activities, she could practically have been reading off Fletcher’s script. But she also said she warned her grandsons about driving through the city, and recalled bitterly an incident from a few years ago when she was pulled over not far from her house. “Can you tell me why you stopped me?” she recalled asking the officer. “Because I can,” she said he replied. The racial divide in Ferguson goes beyond the police. The city’s elected leadership is mostly white, in part, local black leaders said, because of low voter turnout among African-Americans.7 So are its appointed boards and commissions, nonprofit groups and neighborhood associations. Even community events like the farmer’s market and street fair are run and attended mostly by whites. Some of that is due to poverty — it’s hard to join the Parks Board when you’re working a minimum-wage job and raising two children — but Young and others said more residents have to take an active role in the community. One city that has managed to elect a black mayor is Cool Valley, which neighbors Ferguson to the west. 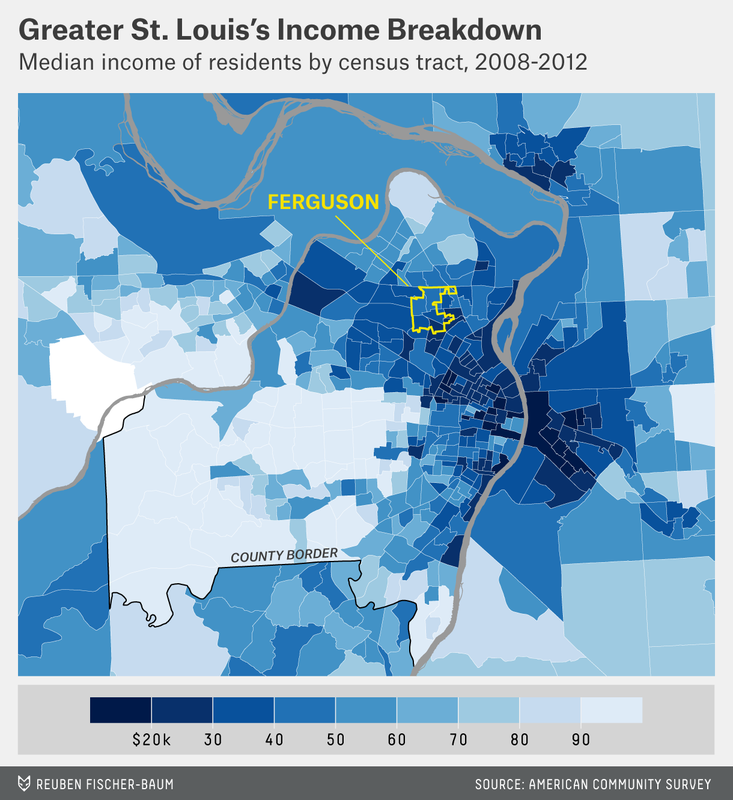 The city is tiny, just 1,200 residents, but is demographically nearly identical to Ferguson. Growing up, Viola Murphy was one of the city’s few black residents. Today, she is its mayor. Her most notable decision came last year, when she eliminated the city’s police department. To Murphy, the move was a simple case of dollars and cents: The department accounted for 60 percent of the city’s $1 million annual budget. Dissolving the department and contracting with an outside community to provide law enforcement services could save $200,000 a year. She certainly wasn’t thinking about the possibility of racially charged protests. But after what has happened in Ferguson in recent weeks, experts have called for similar mergers. By teaming up, St. Louis County’s small cities could in theory afford a more professional, highly trained police force — one perhaps better suited to situations like those in Ferguson. Murphy said she had concerns about the way the police were handling the protests, though she kept the details of that criticism to herself. But she said the real lesson of Ferguson is the need to provide job opportunities to young people of all races — including those who have had past legal trouble. She said she’d recently made a point of hiring people with criminal records, to give them a chance to get back on their feet. The alternative, she said, was more hopelessness — and more Fergusons in the future. Arrest and search figures are from an Arch City Defenders analysis of police stops in St. Louis County. Unemployment figures are based on an analysis of 2013 Current Population Survey microdata. Poverty data is from the American Community Survey for 2010-2012. These figures are for Census Tract 2120.02, which extends into the neighboring city of Jennings. Tract 2119, which also includes part of Ferguson’s southeastern corner, is even poorer. According to American Community Survey data for people 18 to 24 years old living in Census Tracts 2119 and 2120.02. Former Ferguson Mayor Brian Fletcher noted that Ferguson includes several major thoroughfares, so many people driving through the city don’t live there. Neighboring communities also have a higher share of black residents than Ferguson, which may be part of the explanation for the racial disparity in traffic stops. That would not explain the higher rates of searches, however. The increase came in part due to the installation of traffic cameras. These figures are based on three-year American Community Survey data for the years 2010-2012. Turnout isn’t the only issue. Because African-Americans didn’t start moving to Ferguson in large numbers until the 1980s and 1990s, most of the longest-term residents — the people most likely to run in and win local elections — are white.